In this article, we highlight the 20 best online schools for criminology degrees in 2017. According to the United States Department of Labor–Bureau of Labor Statistics Occupational Outlook Handbook, the job outlook is highly favorable for criminologists, criminal justice personnel, and forensic specialists over the next eight years. In fact, the projected job growth is 27 percent faster than the average of most all other occupations. However, due to the small number of available positions and the high degree of specialization within the field, competition for jobs is expected to be strong. This means that education is essential for success. Thankfully, online schooling has become the norm. Even the most prestigious institutions in the country offer online options. Today, individuals can maintain their current career while attending school. This ranking was created to identify the top institutions offering online criminology degrees. The data collected for this list of schools was taken from the National Center for Education Statistics (NCES) College Navigator based on various methodology, including the percentage of admitted applicants, graduation rate, student-to-faculty ratio, and overall cost of in-state undergraduate tuition. We examined schools that offered online bachelor’s degrees in criminology, criminal justice, or closely related programs. From our original pool of 193 schools, we applied our ranking criteria to develop a list of the 20 best online schools for criminology. In the event of a tie, the college or university with the lowest undergraduate tuition price was awarded a higher ranking. Our methodology is listed below. 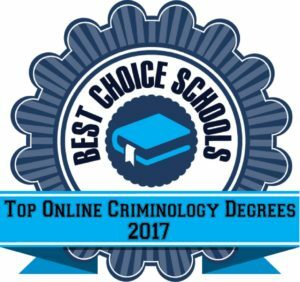 Below is our list of the top 20 best online schools for criminology in 2017. Colorado Tech University is one of the most affordable online schools for criminology. Colorado Technical University was chosen for our list of best online criminology schools primarily due to its affordable undergraduate tuition. Students can earn a bachelor’s in criminal justice and tailor their degree by choosing one of four areas of concentration. These concentrations include cybercrime and security, forensic investigation, homeland security and emergency management, and human services. The program is entirely online, and classes are taught by the same professors who teach on campus. Online courses include criminal law, criminology, ethics in criminal justice, law enforcement operations and report writing, and the laws of evidence. Colorado Tech is ranked by major publications like U.S. News and World Report as a best regional university in the West. Also, the online bachelor’s programs rank #63 out of more than 1,200 surveyed programs. Southern New Hampshire University makes our list of best online schools for criminology due to its high graduation rate. Southern New Hampshire University makes our list of the 20 best criminology schools online because of its high graduation rate. The school offers an accredited bachelor’s in criminal justice with a concentration in criminology. The program is designed for working students who want to attend flexible courses while balancing outside obligations. All classes are delivered online and include ethics and the criminal justice leaders, judicial administration, juvenile justice system, legal traditions, and sociopaths and serial killers. Major publications like U.S. News and World Report rank the institution as a top regional university in the North. In the most recent edition of Best Colleges, Southern New Hampshire University is ranked as the #1 most innovative school in the country. Upper Iowa University’s low student-to-faculty ratio is one of the reasons it is a best school for criminology. One of the top online criminology schools on our list is Upper Iowa University. The institution offers a relatively low student-to-faculty ratio and higher than average graduation rate. Students may earn a bachelor’s degree in criminal justice entirely online. All classes are delivered online and taught by the same professors who teach on the Fayette campus. Criminal justice courses are designed to prepare students with the knowledge and skills needed to protect society and ensure public safety. A wide range of criminal justice and criminology courses are required. Upper Iowa University is ranked by major publications like U.S. News and World Report as a best regional university in the Midwest. Also, the online bachelor’s programs, including criminal justice, are ranked #128 out of more than 1,200 surveyed programs. ASU’s high graduation rate and affordable tuition makes it one of the best online schools for criminology. Arizona State University earns a spot on our list of online criminology schools due to the low undergraduate tuition price and high graduation rate. The school offers a BS in criminology and criminal justice that may be completed entirely online and without attending traditional classes. Online courses are taught by the same university professors who teach on one of the ASU campuses. These courses include domestic violence, gangs, introduction to corrections, introduction to criminal justice, and white collar crime. ASU is a nationally ranked institution by major publications like U.S. News and World Report. Also, the school’s online bachelor’s programs rank #11 out of more than 1,200 surveyed programs, which makes it one of the best online criminology schools on our list. University of Florida is one of the most affordable online schools for criminology on our list. The most affordable online school for criminology on our list is the University of Florida. This school offers low undergraduate tuition and a relatively high graduation rate. Students can earn a bachelor’s in criminology and law degree that may be completed entirely online. All classes are taught online and include advanced principles of criminal justice, criminological theory, law and legal process, and law and society. There are also five criminology and law elective courses required, which can be tailored to suit personal interests and career goals. University of Florida is a top ranked national university and public school. In fact, U.S. News and World Report has ranked the university in its most recent edition of Best Colleges. The online bachelor’s programs are ranked #11 out of more than 1,200 surveyed programs, making the institution one of our top online criminology schools. Regis University is a top-ranked best online schools for criminology. While not the most affordable online school for criminology on our list, Regis University offers a low student-to-faculty ratio and high graduation rate. Regis offers a bachelor’s in criminology program with coursework that may be completed entirely online. Classes include a series of foundational courses and upper division major requirements. Some of the online courses include crime analysis, introduction to criminology, perspectives on terrorism, professional ethics in criminology, research methods, and victimology. Regis is ranked by major publications like U.S. News and World Report as the 23rd best regional university in the West. Also, the school’s online bachelor’s programs rank #92 out of more than 1,200 surveyed programs. Low student-to-faculty ratio and high graduation rate! Saint Mary-of-the-Woods College is one of the best schools for an online criminology degree. Saint Mary-of-the-Woods is one of our top picks for criminology schools online due to the low student-to-faculty ratio and high graduation rate. Individuals interested in law and the psychology of crime may earn a bachelor’s in criminology degree entirely online. Two available concentrations allow students to tailor their degree toward special areas of interest, including psychology and sociology. Online criminology courses include criminal interviewing and investigation, ethical and legal issues, inside the governments, and introduction to criminal justice. Saint Mary-of-the-Woods is ranked by major publications like U.S. News and World Report as the 18th best regional college in the Midwest. Also, the school’s online bachelor’s programs are ranked #212 out of more than 1,200 programs surveyed by U.S. News. Penn State University’s low student-to-faculty ratio earns it a spot on our list of best online schools for criminology. Pennsylvania State University is one of our top online criminology schools due to its relatively high graduation rate, affordable undergraduate tuition, and low student-to-faculty ratio. Individuals interested in criminology and the law can earn a bachelor’s in criminal justice entirely online. The program is one of few certified by the Academy of Criminal Justice Sciences that meets all standards set forth by the ACJS. All courses are delivered online and taught by the same university professors who teach on campus. Courses include concepts of social science research, criminology, ethics in criminal justice, introduction to the law and corrections, and security and police administration. Penn State is ranked by U.S. News and World Report as the 50th best national university in the country and the 14th top public school. Ohio University is one of the best online schools for criminology due to its high graduation rate. Ohio University is one of our best online schools for criminology due to the affordable undergraduate tuition, relatively low student-to-faculty ratio, and high graduation rate. The university offers an online criminal justice bachelor’s degree that can be completed without attending traditional classes. Online courses include civil liberties, criminal justice, criminology, police and society, punishment and society, and social psychology of justice. Ohio University is a nationally ranked institution by major publications like U.S. News and World Report. In recent years, the online bachelor’s programs have earned recognition for being among the best of their kind. The low student-to-faculty ratio is one of the reasons National Louis University is one of our best online schools for criminology. National Louis University’s low student-to-faculty ratio, affordable undergraduate tuition, and relatively high graduation rate earn it a spot on our list of online criminology schools. Students may earn a bachelor’s in criminal justice entirely online. In fact, the program is designed for working students who want flexibility when completing degree requirements. Online courses include criminal justice system, criminal law, criminology, law enforcement, research methods in criminal justice, and sociology of deviant behavior for criminal justice professionals. National Louis University is a top-ranked school. In fact, major publications like U.S. News and World Report rank the school as a best national university. CSU-Global’s graduation rate earns it a spot on our list of best online schools for criminology. Indiana State University is one of the most affordable online schools for criminology. Indiana State University is listed among our top online criminology schools due to its affordable undergraduate tuition, relatively low student-to-faculty ratio, and higher than average graduation rate. Students may earn a bachelor’s in criminology and criminal justice entirely online. Required courses include criminal law and procedure, criminology, ethics in criminal justice, introduction to corrections, and introduction to research methods in criminal justice. There are also four concentrations that students must choose to follow in order to tailor their degree towards personal interests or career goals. These specializations include corrections, forensic investigations, law and administration, and law enforcement and evidence. Indiana State is ranked by U.S. News and World Report as a best national university and its online bachelor’s degree programs have also earned recognition. Arkansas State University’s affordability earns it a top spot on our list of best online schools for criminology. Arkansas State University earns a spot on our list of online criminology schools due to its affordable undergraduate tuition, relatively high graduation rate, and low student-to-faculty ratio. The school offers a bachelor’s in criminology degree that may be completed entirely online. Courses are taught by the same university professors who teach at the Jonesboro campus, and the distance learning program mirrors the on-campus program. Online courses include criminal evidence and procedure, criminal justice systems, introduction to criminal justice, police and society, and social statistics. The university and its online programs are ranked by major publications like U.S. News and World Report. In fact, the most recent edition of Best Colleges ranks the school #59 for best regional universities in the South and #20 for top public schools. Portland State University’s online criminology programs are top-ranked. Portland State University is one of our best online criminology schools primarily due to the affordable undergraduate tuition, relatively low student-to-faculty ratio, and high graduation rate. Students seeking an undergraduate degree in criminal justice can earn a bachelor’s in criminology and criminal justice entirely online. Coursework includes American courts, crime analysis, criminal justice research, criminology and criminal justice, policing in America, and punishment and corrections. Portland State is ranked by major publications as a best national university. Also, the school’s online bachelor’s programs, including criminology and criminal justice, have been recognized among the 1,200 programs surveyed by U.S. News. The high graduation rate is one of the reasons University of Wisconsin is on our list of best schools for criminology. University of Wisconsin Whitewater offers affordable undergraduate tuition and a high graduation rate, and is one of the top online criminology schools on our list. Students interested in criminology and law enforcement may earn a bachelor’s in criminology that is tailored to suit personal interests in law enforcement. Courses are delivered online and include communication in the context of criminal justice, criminological theory, introduction to criminology, sociology of punishment and corrections, and women and violence. The program is offered on a full-time basis, and summer courses are required. The University of Wisconsin Whitewater is a regionally ranked institution. In fact, U.S. News and World Report ranks the school #49 among the best regional universities in the Midwest and the 9th top public school. Also, the online bachelor’s programs rank #7 out of more than 1,200 surveyed programs. Affordable tuition and high graduation rate earn Missouri State University a top spot on our list of best online schools for criminology. One of the best online criminology schools on our list, due to affordability and a high graduation rate, is Missouri State University. Undergraduate students may earn a bachelor’s in criminology degree entirely online by taking flexible courses taught by university professors. Four primary areas of focus are offered so that students may tailor their degree to suit career goals. These focus areas include corrections, courts, law, and police. All classes are delivered online and include criminal law and the courts, criminological theory, institutional and community-based corrections, juvenile theory, policing, and research methods in criminology and criminal justice. Missouri State University is ranked by major publications like U.S. News and World Report. In fact, the most recent edition of Best Colleges ranks the school 71st for best regional universities in the Midwest and 16th for top public schools. Also, the school’s online bachelor’s programs rank #128 out of more than 1,200 surveyed programs. Florida State University is one of our top picks for best online schools for criminology. Florida State University is one of the top criminology schools online on our list primarily due to the highly affordable undergraduate tuition costs and high graduation rate. Students may earn a bachelor’s in criminology and criminal justice entirely online and without any campus visits. The program mirrors the on-campus criminology program and offers online classes taught by many of the same professors who teach on campus. The program is designed to provide students with the knowledge needed to pursue criminal justice careers, graduate degrees, or law school. Florida State is a nationally ranked institution and top public school. Major publications like U.S. News and World Report rank the school as a top university. The online bachelor’s programs rank #34 out of more than 1,200 programs surveyed by U.S. News. WSU offers a low student-to-faculty ratio, which is one of the reasons the institution is on our list of best online schools for criminology. Due to its low student-to-faculty ratio, high graduation rate, and affordable undergraduate tuition, Washington State University earns a place on our list of online criminology schools. WSU offers an accredited online criminal justice program for undergraduates that is designed to prepare students for careers, graduate programs, or even law school. Courses are taught by the same university professors who teach at the Pullman campus. Online courses include crime control policies, criminal law, criminal procedure, introduction to criminological theory, and introduction to the administration of criminal justice. WSU is ranked by major publications like U.S. News and World Report as a best national university. In fact, the online bachelor’s programs rank #34 out of more than 1,200 surveyed programs. Old Dominion University’s cheap tuition helps earn it a spot on our list of the best online schools for criminology. The Department of Sociology and Criminal Justice at Old Dominion University offers a criminal justice degree that may be completed entirely online. ODU is one of our top online schools for criminology due to the low student-to-faculty ratio, high graduation rate, and affordable undergraduate tuition. Students may earn a BS in criminal justice entirely online. Courses include criminological theory, research methods, and an upper level law component. All courses are led by university professors who regularly instruct on the Norfolk campus. Old Dominion is ranked by U.S. News and World Report as the 210th best national university and 118th top public school. Also, the online bachelor’s programs rank #49 out of more than 1,200 surveyed programs. Texas A&M University is our #1 pick for the best online schools for criminology. Texas A&M University Commerce is on our list of online schools for criminology because of the school’s low selectivity rate, low student-to-faculty ratio, high graduation rate, and affordable undergraduate tuition. The online criminal justice bachelor’s degree program is designed to prepare students for careers in major areas of corrections, courts, juvenile justice, law, and other related fields of criminal justice. All classes are delivered online and include crime and criminology, criminal investigation, courts and criminal procedure, introduction to criminal justice, police and law enforcement, and senior seminars in criminal justice. Texas A&M is ranked by major publications like U.S. News and World Report as a best national university and is our #1 pick for best online criminology schools. 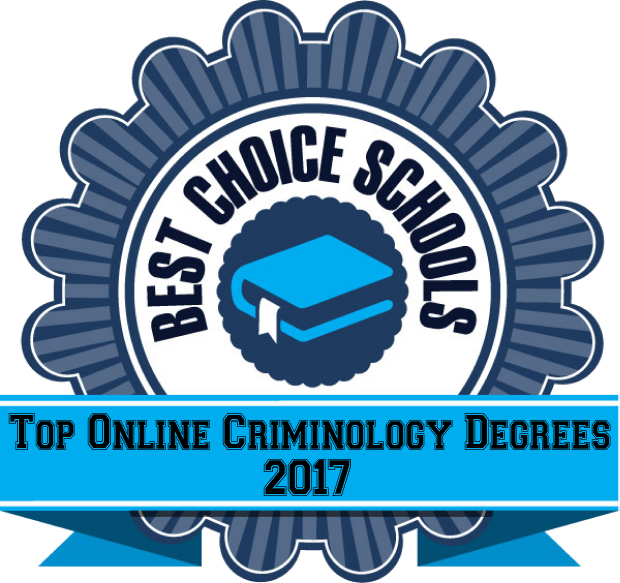 This article highlighted the 20 best online schools for criminology degrees in 2017.